I've been writing of my love for this trilogy for the past two weeks. I'm so happy that the third and final book completely delivers. Again, I'll tackle this without spoilers and speak vaguely of themes and what I most enjoyed. The novel picks up with an intriguing prologue that I went back and re-listened to after I finished the audiobook. It then picks up with Pressia, Lyda, Partridge, and El Capitan where we left them at the end of "Fuse." It was great to listen to these three books back-to-back, and I highly recommend doing so if you can. There's a lot to keep track of in the complicated, well-woven plot, and some of the other reviewers on Goodreads who took time off in between noted their confusion. The conclusive novel digs deeper into what a rebellion looks like. I agree with other reviewers who think this series has been mis-marketed as YA - it has the romance tropes, but is otherwise far more complex and darker. The novel captures the messiness and lack of surety that plagues those fighting to overthrow the Dome. Each character faces their own unique uncertainty and concerns, fails in their own unique way, and figures out their unique path forward. Miscommunications and missed connections with other rebels abound, as do differing goals, motivations, hopes, and plans for the future. The way to a new future post-apocalypse is not neat or certain or easy. It is confusing and difficult, impossible at times to know if one's actions will do more help or harm. 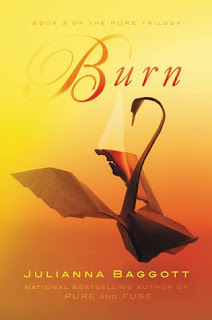 "Burn" portrays this hopeful mess beautifully, with well-drawn, believable, heart-breaking characters. El Capitan's still my favorite, Lyda and Pressia are inspiring, and Partridge is fascinating. The audio narration does not disappoint. "Burn" delivers on the promise of "Pure" and "Fuse" in a satisfying, realistic way. Verdict: Affirmed. Highly recommended for fans of post-apocalyptic fiction who want to see what the complex process of starting to rebuild looks like up close. "Burn" by Julianna Baggott, published February 4, 2014 by Grand Central Publishing. Audio narration by Khristine Hvam, Casey Holloway, Kevin T. Collins, and Nicholes Tecosky, published February 4, 2014 by Hachette Audio.